Well, it's raining. It's been raining since some time last night. A few thunderstorms here and there as well. LOTS of rain. The weather map I'm looking at is showing that we've had between three and four inches so far, and it's not supposed to stop until tomorrow. There's a river down the road that I can see from here, and I imagine it is getting high. Fortunately we are WAY up on a hill and it would have to rain for a LONG time before it would reach up here. I kind of like the rain so this isn't bothering me one bit. We've been getting lots of rain lately too. This past Saturday we had really severe weather with several tornados; one of which went right through downtown Atlanta!! I've never heard of that around here before. It was really scary! But, yeah, I don't mind rain...we definitely need it! Yeah, I heard about that tornado. If it's not raining much in the morning I'm going to try and get some pictures of the river. We'll see though. well... my wife actually had to come down from a different side of the main road to get home last night. This has to be somewhere around 20 feet above where it normally. Well I went down there to see this morning and it was already lower. Still at least 10 feet above normal, so it's pretty impressive. The other end of our dirt road which we fortunately don't need to use, was demolished. 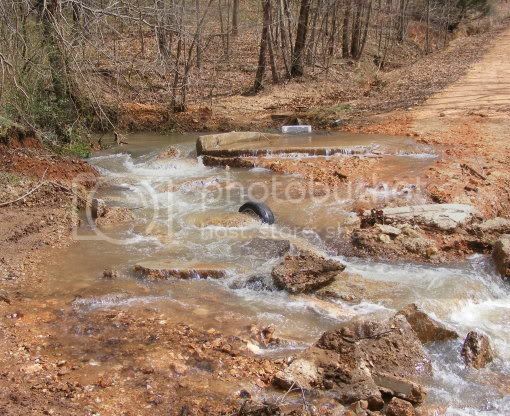 Just a creek too, washed the road right out. I got pictures of it all but I'll have to try and upload them later. Oh, and our well water was a little cloudy for the first time ever. Hey, I finally got a few of the pictures uploaded. Here's just a general shot of the river. You can see water WAY out into the woods. 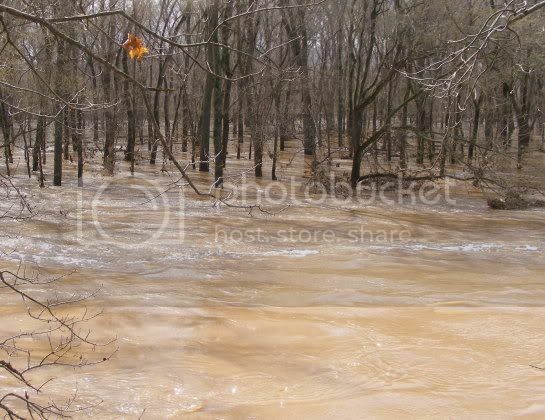 There's usually no water anywhere you see trees. And here is what the other end of our road was looking like the other day. Fortunately we don't use that side... but it has been fixed up a LITTLE since then. Good enough for people to pass anyway. WHOA! That is very impressive! Holy moley! Thats alot of water! I love rain! is that flood pictures ?? Yes, those are flood pictures. I deactivated that account as it is from Pakistan and a spammer. 99.999999999999999% of all posts from Pakistan are spam. Replying to a topic from 6 years ago is another clue. While unlikely, if you feel I deactivated your account in error, feel free to make a post in the guestbook explaining that this was a legitimate post and you wish to participate here with no spamming. We've definitely had some floods several Springs. Still thankful we're way up on a hill.